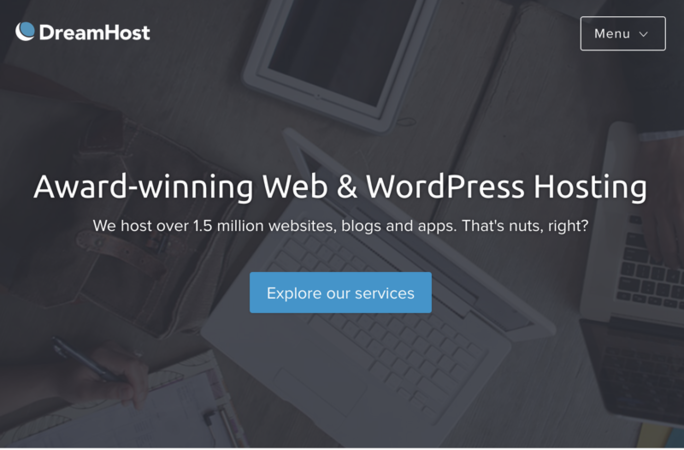 DreamHost is a popular award-winning hosting company, and one of WordPress.org’s officially recommended hosts. They offer domain registration and web hosting services, including managed WordPress hosting. You’ll find they offer everything you need to grow your website, whether you’re a new blogger or established business. See our expert DreamHost review to decide if it’s the right choice for you. DreamHost was founded in 1997 by four friends at Harvey Mudd College in Claremont, California: Dallas Bethune, Josh Jones, Michael Rodriguez and Sage Weil. Since then, DreamHost has become one of the most well-known and popular web hosting companies. They now host over 1.5 million websites, including over 750,000 WordPress installations. They’ve won PCMag’s Business Choice Awards for Web Hosting Service for 2014-2016. DreamHost is also a certified carbon-neutral host, and makes every effort to conserve resources in their own offices. They’re also a member of the U.S. Green Chamber of Commerce. DreamHost specializes in providing hosting for web designers, developers, bloggers and online businesses. They offer shared hosting, managed WordPress hosting, VPS hosting, and dedicated servers. They also offer cloud servers and cloud storage. All of DreamHost’s plans use SSD drives for faster loading. DreamHost also uses a proprietary control panel instead of cPanel. DreamHost also offers a managed WordPress hosting plan called DreamPress. DreamPress is over 5 times faster than shared hosting. The servers are optimized for WordPress, and can handle traffic spikes without your site going down. In our DreamHost review, we found that they provide high quality, reliable hosting at very affordable prices. Their plans include everything you need to build your website, and room to upgrade when your site grows. DreamHost offers 24/7 support via a ticket system. You can open a request for support through your customer dashboard. They also maintain a forum on their website where you can post your questions. Support staff is active in the forums, and most questions are answered within 24 hours. Many reviews mention the quality of their support, though some reviewers were frustrated by not having access to immediate phone or live chat support. While live chat and phone support can be useful for simple questions, customers with more complicated issues are usually directed to open a support ticket anyway. DreamHost maintains an extensive knowledgebase on their website that answers the most common questions users have about hosting. If you have a more complicated issue, it probably could not be answered immediately via live chat or phone even if it was available. DreamHost has an incredible 97 day money back guarantee. Most hosts offer just 30 days. That means that if you cancel your account within 97 days of signing up, you’ll receive a full refund of all hosting fees. DreamHost is a popular web hosting company, but it may not be right for everyone. Consider these pros and cons before choosing a plan. Award Winning Hosting – DreamHost has won the PCMag Readers’ Choice Award for best business hosting for the past 3 years. They rated high in reader surveys for their reliability and tech support. No Plugin Restrictions – Unlike other managed WordPress hosting providers, DreamHost does not forbid you from using any plugins on your DreamPress account. Free Domain and Privacy – Every DreamHost plan includes one free domain registration plus domain privacy, so your contact information isn’t made public on the web. Monthly Billing With No Setup Fee – You can choose to pay month-to-month with any DreamHost plan, without having to pay a setup fee. Support Isn’t Immediate – DreamHost only offers support via a ticket system. They don’t offer live chat or phone support. They do aim to respond to all support requests within 24 hours, but some users find it frustrating to have to wait for an answer. No cPanel – DreamHost uses their own custom-designed control panel, which allows you to manage your billing and domains as well as your hosting. Users who are accustomed to cPanel might not want to try a new control panel. Now that you have read through our entire DreamHost review, you might be wondering whether DreamHost is the right web host for you. DreamHost is highly rated for their fast and reliable hosting. They’ve won numerous awards and get rave reviews from their customers. But it may not be the right choice for you if you need a lot of help getting started. Since they only offer support via tickets, we recommend DreamHost to DIY users who are comfortable figuring things out on their own using the comprehensive knowledgebase. WPBeginner users get an exclusive 40% discount on shared hosting and a free domain with our DreamHost coupon code, or a 25% discount on managed WordPress hosting with our DreamPress coupon code. This is a great company. I’ve been using them for 9 years for a number of small web sites. They have been fantastic for someone who isn’t super web savvy. Plus you only pay an annual fee for as many sites as you want (I’m sure you wouldn’t use this feature if your site got 50,000 hits a day). I just started learning WordPress and again they have been excellent in their help. Also, I use them for my domain name management as they don’t inundate you with extra fees and ads. Dreamhost tech support is bad. Well, not just bad- non-existent. Many emails, no response. And you cannot call them on the tel-e-phone! Simply awful. The only available support is so-called “24/7 in-house support”, which in the Dreamhost reality means you’ll get an answer on your question / problem in a few DAYS over email. And if their reply wasn’t completely clear, wait a few days for another reply. This company lives in some sort of parallel universe, where everything is extremely slow and inefficient. Literally the worse web-hosting experience in many years. I haven’t purchased web hosting with anyone yet, but I want to share that DreamHost offers 1 free shared hosting plan for non-profit, charitable organizations registered in the US as 501(c)(3) organizations. I thought this was a great offering, and I like the idea of joining a company that assists non-profits. The company is also dedicated to being as “green” as possible. I absolutely love this service! I am a novice at setting up and updating websites but DreamHost makes it easy. If you have a question about anything, you get a response with the answer within 24 hours. I recommend this to all my friends and family who are starting a business and need a website. Love this service! As a newbie, they made it very accessible, clearly stating each process step by step. They have integrity, and the set up with WordPress works beautifully! Haven’t had any issues. Glad I went with Dreamhost! AMAZING service. I had even canceled my plan and they still PROMPTLY helped me get access in order for me to migrate my site to another host. Very good customer service. I just wish they had a plan to suit my needs better. I’d still be a customer. I have ten wordpress sites on dreamhost, and plans for several more. They are a stellar hosting service, with unlimited domains for one hosting account. Their support has always been timely and accurate. I recommend them without hesitation. Fast response, personable message, instantly cleared up my confusion over a message from you guys. So glad YOU handle my hosting and domain reg. We recently changed our hosting to Dreampress and are very glad that we did. Their plans and service are the best that we have found in our 15 years experience. Terrible service. I was very surprised. We connected and then nothing. They kept me waiting but didn’t ever try to let me know what they were doing. I finally disconnected. It was a very easy question. Dreamhost has personal, friendly and helpful customer service — I’m quite impressed. EXCELLENT customer serve as usual; real humans, real conversation, no scripts, belligerent sticking to a company line or robot-style refusal to answer questions. REAL interaction, o how we all miss it! I love Dreamhost. I had a problem with my contact page. The great and knowledgeable support staff guided me every step of the way, and fixed my problem. I can not say enough good things about my experiences with Dreamhost. I have been a Dreamhost customer for about a month. I transferred to them because of difficulty getting support from my prior provider which did provide phone support. The phone support was nice at first, as long as I didn’t have a serious problem. When the rubber hit the road, however, it was useless. What a contrast at Dreamhost! I’m fine with email support if I get a knowledgeable person on the other end. My responses and help were excellent. Most responses were within a couple of hours after the initial contact. Both difficult problems were solved promptly, without blaming Microsoft or Google or Apple, but helping me through. I’m reasonably knowledgeable, so I appreciate the question as to your skill/comfort level at the beginning, which can help sidestep the “reboot your computer” type of answer. I had always had great service from Dreamhost. I have hosted all my websites with them. They are reasonable and good. It’s solid comfort to know that Dreamhost has my back when I get stuck with a technical problem, which is quite often. Tip o’ the hat, Dreamhost. Awesome service and support! 10/10 because I know very little about computers and WP. DreamHost have always helped out by getting access back into the dashboard, after I either crash through by forgetting my password or stuffing up a plugin. I really have nothing negative to say after over just six months experience with them and WP. I am learning though…. Twice in two years I needed some help from support, and both times the answers came in about 10-12 hours. I have mixed feelings because I can get help within an hour from other providers via phone. Yes, I understand phone support costs more, but I’ve seen so many reviews where a call to a real person would probably have fixed the problem. I like Dreamhost, but as long as I can’t reach someone instantly by phone I won’t use it for anything critical. NO problem at all!! They solved all my requests!!! Great team in high speed!!!!!! I’ve contacted support a couple of times now, at first it was my lack of familiarity with their control panel, But once I got used to that I need some guidance in a couple of areas. The support was great, pointed me in the right direction with links guiding me to explanations and instructions. This lines is for telling you that I had a really good experience with DreamHost, they resovled avery problem that I had. I recommend this host always! This review is for the extremely high recommendation for hosting with Dream Host. Best professional company I’ve purchased hosting from in many many years. Very great prices on VPS and Dedicated servers. I LOVE the servers they are the best my money has been spent on in all of my life. I will be hosting with them for many more years I foresee a great relationship with Dream Host as I make them allot of money as well. Overall best customer support on the entire web! Thank you guy and gals, I know what you do and it’s a tough job but a fun one! Keep up the awesome fantastic work and customer support. I am totally discussed with the quality of the support. I will be looking for a new host. This level of support is unacceptable. The issue is still unresolved after about a month. It usually took about 10 hours for a response. The responses I did get were totally inadequate. I have been trying for months to get back as a subscriber. My VISA card ran out of date so it now appears all my Data has been lost for my website. I have tried to resubscribe but have failed to persuade Dreamhost to recognise me. Very sad as I really appreciated bing a customer. My site quit working as a result of the “upgrade” from PHP 3 to PHP 5. As a result I am forced to make (or have made for me, as I am not a web programmer) major changes in my site. It would be much easier if Dreamhost would continue to make PHP 3 available. Is that possible? Man, you should consider maintain your website in PHP5, because PHP3 is older than my grandma! Imagine how much bugs and security issues must have in this old version! Coming from a host that used CPanel, I had a bit of a learning curve to learn how to do stuff on DreamHost. But the wiki documentation is amazing and I quickly found my way around the DreamHost interface. I’ve found customer support from DreamHost is prompt and very helpful. You are contacted by a real person who really wants to help and the same person sees through your support issue so you don’t need to keep repeating the whole story. As a new DH customer, some of the setup requirements are a little foreign to me — every hosting company has its own setups, especially where Linux servers are concerned because of the tremendous variability of linux add-ons from one host to another. Along the way I have relied on the technical support folks via the live chat, and I’ve not once been disappointed. Everyone has been eager to help, provided an answer or a solution in only moments, and I couldn’t be more pleased. So far, I would give DH an A+ for their service both in terms of timeliness and quality and I’m equally thrilled with the performance of their servers and hardware infrastructure. My site has never been so quick. I’ve been very happy with my dealings with their technical and accounts support. Prompt replies, problems solved, and very understanding. I am a happy customer of DreamHost. I always appreciate the amazingly quick response times from them, and I really appreciate that the people who work there try their best to help me with my problems. They go above and beyond, sometimes I feel like I have professional web programmers on call, but I get people who actually care and do research and troubleshoot whatever problems I may be having. Very stable hosting, fair pricing, I cannot complain. Have been with DreamHost for a number of years, and I would not think to look elsewhere for my hosting and domain needs. Dreamhost is the best hosting provider I have ever worked with. 10/10. I am very impressed with the technical support, very helpful and timely responses. This is a bit of a mixed bag for me. First, I would give the employees I’ve dealt with regarding tech support issues–during many, many years of being a DreamHost customer–high marks. They are reasonably prompt, courteous, and as helpful as they can be. On the other hand, for some issues, I often receive from DH links to wiki entries that provide very detailed and complex instructions for researching and addressing my problem. These instructions presume a good bit of expertise. So, for my purposes, DH is more self-service oriented than I would like. I have a chronic database problem with a very large phpBB forum that’s hosted on DH and there appears to be no way I can just get their people to find the problem and fix it. Instead, I get referred to some materials about how I might use shell access to find the problem and fix it myself. I have better-than-average tech skills, but no experience of knowledge of MySQL and related services. So, I’m stuck. Given that DH is quite inexpensive, I don’t really expect employees to spend the kind of time I need. So, how about a paid service of some kind for more complicated support issues? Bottom line: Great support people, but a company that can’t seem to provide, even for a fee, the kind of advanced help I need. Dale, I think you need to consult a systems engineer about your issues; fixing client apps is not something I’d expect a host to do. I was very impressed with technical support, especially when it was determined that the problem was with my ISP, they kept tracking the problem with my ISP and let me know when the ISP problem was resolved. DH is one of two ISPs I use and definitely the better. Their interface is cleaner and the support excellent. I’m more than happy to recommend them. Excellent service! Dreamhost has a great customer support. Its an awesome company, I definitely recommend it! Five stars. Always easy to work with. Thanks for your help. Fast and on the ball. 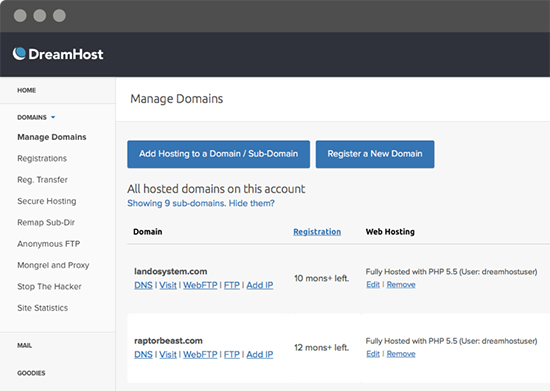 as a standard SOA and DNS option, dreamhost works well. However when looking to rapidly expand within zone files, dream host falls short. the API is not as good as it should be, support team also seem to be unable to answer on the more complicated problems and seem to simply just not answer the more difficult questions. I personally would not use dreamhost again, but I would recommend them if you use them for what they are, its not a bad option for owner managed and small business, corporate space they dont fair so well. Customer service for pre-sales was simply excellent. Of course you’d expect that because they want to gain more customers. After sales – in respect of tech support – outstanding! I have nothing but good things to say about DreamHost. This is my first time doing everything on my own so I needed help. The response from DreamHost everytime was fast and every issue resolved quickly. Just received a customer survey from DreamHost inviting me to add a review to this page for an issue that was opened days ago was closed without resolution by DreamHost. Since DreamHost invited me to leave a review, I’ll take a break from moving sites to another provider to express my disgust. The original issue(s), caused by DreamHost’s technical team, miscommunicated by dreamhosts marketing team, and adequately addressed by DreamHosts support team has left me flabbergasted. Obviously with 50+ domains on DreamHost I was a pretty happy long time customer. Spent the bulk of the weekend moving sites to AWS and Digital Ocean to get out from the cloud of another bungle. We have been locked down for the holiday season for more than a month across all of our sites, this is costing us time and money that could be better used supporting our customers and their sites. The customer service is detail oriented and they’re always eager to render more help to clients. I recommend Dream Host services to entrepreneurs without reservation. Dreamhost was great for the last year, until they suddenly changed their VPS policies regarding root with only a few business days notice….over a holiday week no less. Very unprofessional support when I submitted questions, even refused to call me despite the fact that they are costing me thousands of dollars to rapidly move to a new service. Essentially they told me they don’t value my business. It’s really a shame they seemed like a good company up until now. Rating of 1 out of 10. Recently had a question and was pleasantly surprised at the rapid and clear response. Go Dream Host! Dreamhost has been great in getting our domain up and running. It was recommended to us by a long time user–and for a good reason! The service was fast, friendly and professional. Thank you! I have had nothing but an AWESOME experience with DreamHost. These guys are always on point with support, which is essential. I am glad to be onboard and will recommend them to anyone who needs hosting! Terrible! I have two websites with Dreamhost. I let the site affiliated with this email expire and the moment I received an email from Dreamhost saying that site was down I began getting error messages on all incoming messages from my main Gmail account. Every incoming email has an error message attached …. It refers me to Dreamhost. I contacted customer service to ask them to fix this. My reply was to pay the $190 past due and it would be fixed. I wrote a second time and was told the Gmail account is not part of Dreamhost so it isn’t their problem. Since this is how I’m treated at Dreamhost I’m looking for a new hosting company for my second website.